Precision Watches & Jewelry has a state of the art workshop and performs all watch repair work on premises in the Willow Grove mall. genuine watch parts for your timepiece. state-of-the-art facility to ensure your watch receives only the best care available. Precision Watches & Jewelry has a state of the art workshop and performs all watch repair work on premises in the Willow Grove mall. 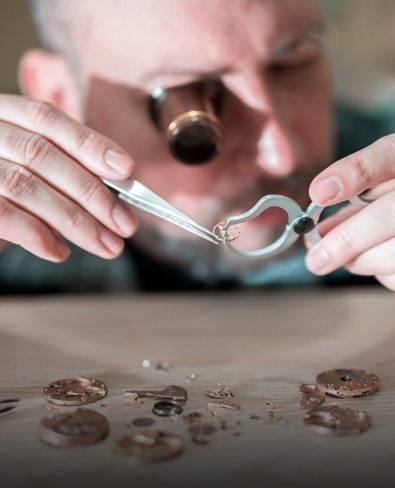 Our own certified watchmaker and master jeweler perform all repairs, from the simplest battery change to the most complex overhaul and design work. Leave your luxury watch at Precision with confidence, knowing it will be handled with the care and attention it deserves, using only top of the line machines and original manufacturer products, all without ever needing to leave our workshop. We provide watch repairs and services on all the top brands including Omega, TAG Heuer, Tissot, Raymond Weil, Rotary, Breitling, and more. No chargeable work will be undertaken without your consent. We always agree on a price before completing any watch repairs. You can rest assured that there will be no hidden charges. We are honest and transparent with our pricing and are proud of the prices we offer. We are certain you will be happy with the service that we offer. If you do not wish to proceed, watches will be returned free of charge.